A comedy-drama about a dancer living in New York and a would-be musician who platonically share an apartment and eventually fall in love as they struggle to make it in the New York "rat race." Tony Curtis, still a saxophone player after Some Like it Hot, arrives from the sticks in New York, moves into a run-down tenement boarding house, and tries to make a career in the sleazy nightclub run by Don Rickles. He's just an inch away from crime and, in due course, a bit closer to Debbie Reynolds, a dance hall "hostess". 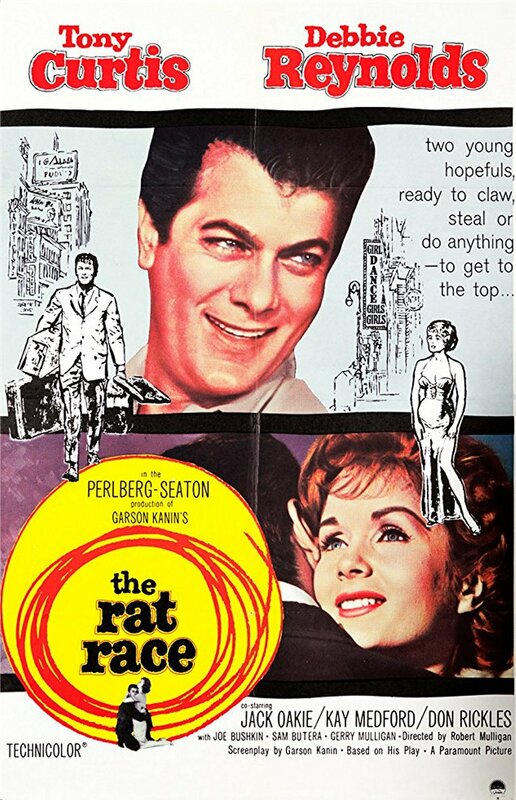 The Rat Race is Hollywood's idea of what a Beat movie should be like; the settings are picturesquely drab and Elmer Bernstein contributes a racy score but Curtis and Reynolds, charming as they are, are much too pretty and clean-looking to be convincing. And nobody smokes a joint, either.